I grow fresh basil all year long–in the summer outside on my deck, and in the winter inside on my kitchen windowsill. It’s one of the easiest plants to grow, and it smells so good! 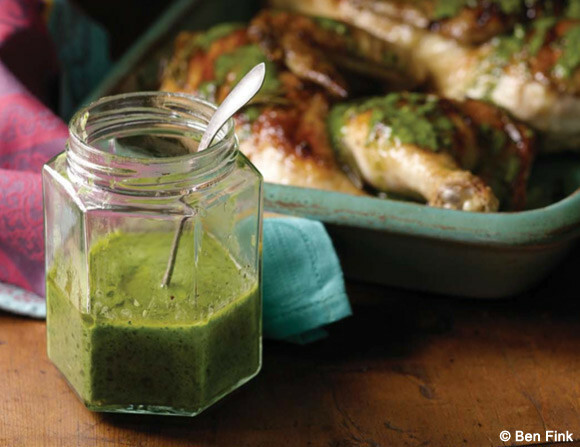 Here’s a wonderful basil marinade that can turn any protein or salad into a quick, healthy, but restaurant-worthy meal. This is a great way to try your hand at using basil. This drizzle is really versatile. I usually make this to serve over grilled chicken breasts, but you can also try it over vegetables, steak, pork chops . . . just about anything but dessert. 1. Fit a food processor with the metal chopping blade. With the machine running, drop the garlic through the tube to mince it. 2. Stop the machine and add the basil. Pulse a few times to chop it. With the machine running, add the lemon juice, oil, and 2 tablespoons water and process into a thin sauce. Season with the salt and pepper. Let stand at room temperature until ready to serve, but no longer than an hour.